Today in Masonic History Mordecai Peter Centennial Brown passes away in 1948. Mordecai Peter Centennial Brown was an American baseball player. Brown was born in Nyesville, Indiana on October 19th, 1876. When he was young he worked in coal mines in eastern Indiana. This was where he got his nickname from some sports writers of "Miner" and sometimes the incorrect spelling of "Minor." He was also nicknamed "Three Finger", sometimes "Three-Finger", this was more serious. When Brown was young he was working on the family farm and was feeding material into the farm's feed chopper. He slipped and his hand was mangled by the knives. He lost his index finger in the accident. To make matters worse after the doctors had put his hand back together as best they could, Brown fell and broke his hand. His middle finger was not set correctly and it ended up permanently deformed. Despite the condition of his hand, Brown taught himself to pitch by throwing a baseball at the side of the barn, as many young kids of the time did, aiming for knots in the barn boards. Brown and others discovered that his unique way of holding the ball gave him an incredible curve ball. His release also gave the ball extra spin which made the ball difficult to hit and even harder to hit in the air. In 1898, Brown was playing third base for a semi-pro team when the pitcher failed to show up. Players in the league quickly discovered Brown's pitching ability. In 1904, he signed with the Chicago Cubs. With the cubs he was part of two World Series Championships, including the 1908 Championship which would not be repeated by the Cubs until 2016. Brown also won 20 or more games in a row at least 6 times. In 1909, in the off season Brown played for a team that had several games in Cuba. There he developed a mysterious illness and was forced to return home. Because of the illness he sought medical treatment. During the examination the doctor took a look at Brown's knee and told him that he needed to stop playing Baseball or he was going to lose the use of his leg. Brown ignored the advice and continued to play. In 1912 he was released from the Cubs and he played for various teams and was even a player manager. 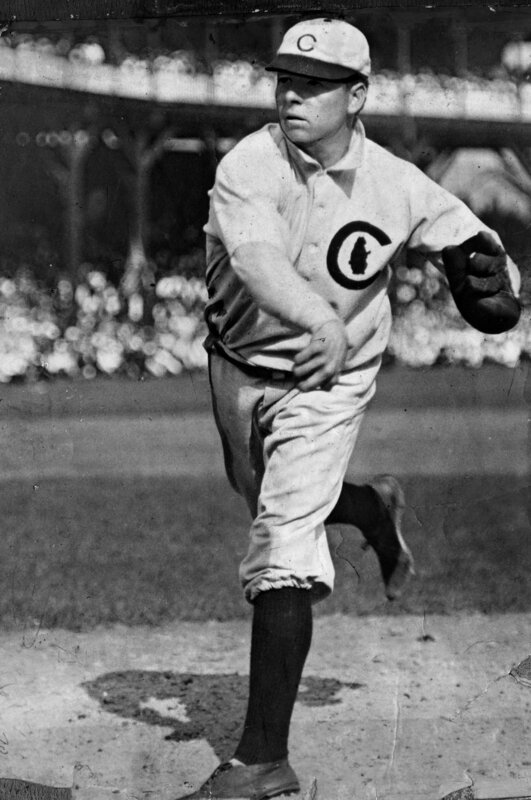 He returned to the Cubs for his final season in 1916. On September 4th, 1916, Brown came up against Christy Mathewson. The two men had pitched against each other often and at one point time were considered the two best pitchers in Baseball. In the Cubs 1908 World Series win, Brown and Mathewson pitched against each other in the final game of the series. The final game between the two men was billed as the last game between two baseball greats, although the teams themselves were well out of any contention for the World Series. In the final game, both men retired after it, Mathewson's Cincinnati Reds came out on top 10-8 over the Cubs. After retiring Brown returned to his home in Terre Haute, Indiana. There he continued to be part of minor league baseball and occasionally even took the field for exhibition games. From 1920 to 1945 he ran a filling station, more commonly now called gas stations, in Terre Haute. It became the place to hang out in Terre Haute and even became something of an unofficial museum. In more modern times, Brown became part of pop culture a Simpson's episode called "Homer at bat." In the episode, the nuclear power plant owner, Montgomery Burns wants to get ringers on the plants baseball team. He tells his assistant, Smithers, to get Cap Anson, Honus Wagner (another mason) and Mordecai "Three Finger" Brown. Smithers must then explain that all three not only retired, they are deceased. Brown passed away on February 14th, 1948 from complications associated with diabetes. Brown was a member of Edward Dobbins Lodge No. 164 in Lawrenceville, Illinois. When his petition was received it was received it was referred to the District Deputy Grand Master for confirmation that the loss of his fingers (one missing and one mostly non-functional) would disqualify him for membership.